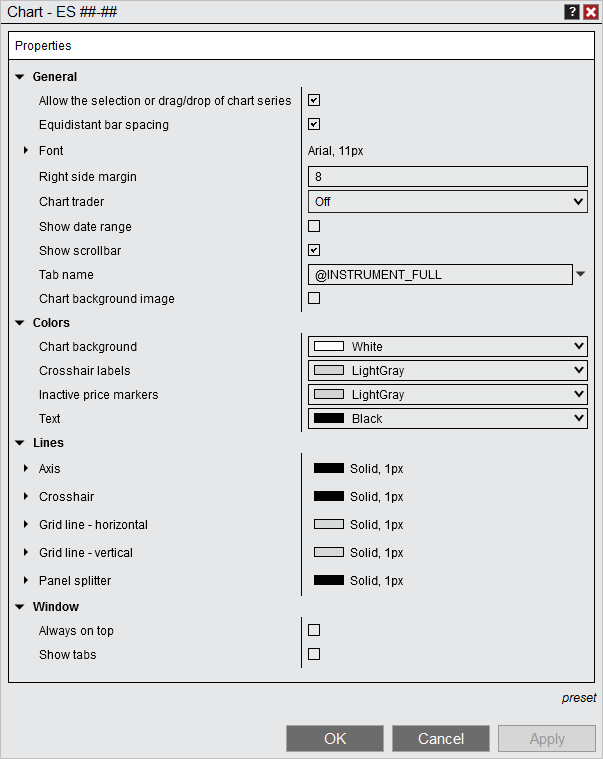 Many of the visual display settings of NinjaTrader charts can be customized using the Chart Properties window. Enables or disables plotting bars an equal distance from each other. Please see the "Working with Multiple Data Series" section of the Help Guide for more information. Sets the chart trader display mode. Enables or disable showing the date range label in to the top left of chart. The date range reported is the dates that are currently visible in the chart. Sets the name displayed in the tab. By default the instrument name is displayed. Sets the drawing properties of the splitter drawn between panels. Defaults for the Chart Properties window can be saved by left mouse click on the "Set Default" button. Please see the "Saving Chart Defaults" section of the Help Guide for more information. A number of pre-defined variables can be used in the "Tab Name" field of the Chart Properties window. For more information, see the "Tab Name Variables" section of the Using Tabs page.